It was the soundtrack to a million slow-dances and the biggest till-ringer of 1991. But did Bryan Adams’ mega-hit hurt his rock credibility…? It’s unlikely that any musician has ever spent an hour more profitably than Bryan Adams did in 1990. The Canadian bandleader was working in London with producer Mutt Lange when the pair were asked to write a theme song for the forthcoming Robin Hood: Prince Of Thieves, and handed a tape of the film’s soundtrack by composer Michael Kamen to get them started. In June 1991, Adams would have that question answered in emphatic style. 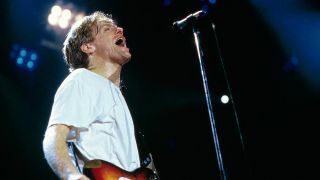 By that point, the singer had enjoyed both critical respect and massive sales for 1984’s Reckless album, but had lost a little momentum with 1987’s Into The Fire, and must have felt some pressure to write an anthem for the new decade. Now, Everything I Do attacked on three fronts, released not only as a single, but also featured on both the Prince Of Thieves soundtrack and Adams’ own studio album, Waking Up The Neighbours.